Outline: Story of Christ asleep in the boat, etc. from Matt.8. Application for the unsaved. Prayer of repentance. One time when Jesus was on earth, He was walking by the seashore. Great crowds of people tried to get near Him because He healed the sick and the lame and the blind. He talked to them and taught them many things, always telling them that God loved them. 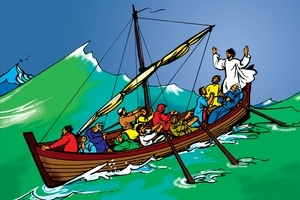 In the evening He and His disciples started for the other side of the sea in a small boat. Jesus was tired after this long day among the crowds. He went to the stern of the boat, lay down, and soon was fast asleep. Suddenly the wind began to blow hard. (Pause 3 seconds) A great storm came up. Huge waves rose high and crashed against the small boat and it began to fill with water. The disciples were afraid, for the storm became worse every moment. (Pause 3 sec.) But Jesus was still sound asleep. Finally the disciples could not bear it any longer. They went and awakened Him. "Master, Master!" they cried. "We perish. Save us!" Jesus saw the storm and the great waves, but He said to them, "Why are you afraid?" And He arose and rebuked the winds and the sea, saying, "Peace, be still" (Pause 3 sec.) Immediately all was still. No wind, no waves, no storm. All was peaceful and quiet. They were saved. Then Jesus said to His disciples: "Why are you so fearful? How is it that you have no faith?" And they were surprised that even the sea and the wind obeyed the command of Jesus. But Jesus could do everything, because He is God. We have much sin and badness. Often we are afraid like we were in a bad storm. God's Word says, "Believe on the Lord Jesus Christ and you will be saved." Jesus came to this earth to help us. He will save us from our sins. Sin will destroy us. But Jesus can save us. He will put peace in our hearts. Would you like Him to save you from your sins? Tell Him, "Dear God, please save me from my sins and make me your child." He will answer your prayer right away. Then you will have peace in your heart. You need not be afraid again, because He will be with you always. He will protect you and care for you. He will help you in all the troubles of life. Then when this life is over He will take you safely to heaven. Jesus said, "Come to Me...all who labor and are heavy laden, and I will give you rest." "Lo, I am with you always." Don't be troubled, ...believe!" Sound effects: water and wind, storm; silence. Mark 4:40; Acts. 16:3l; Matt. 11:28. GRN has recorded a version of this script in 156 languages and dialects. See full list. See different versions of this script in Portuguese, Tagalog.